The patented StretchRite gives you a safer, more effective way to improve flexibility and get total body relief for sore, tight muscles. 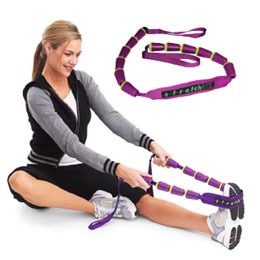 Features a non-elastic strap for stretching and conditioning every major muscle group including your arms, shoulders, torso and legs -- making it easy to perform each stretch properly and effectively. The handgrips serve as visual feedback, encouraging you to stick with your program. You not only feel the difference but you can actually see how flexible youve become! Comes with a poster. The Stretch Rite is a great tool for the following: stretching out hamstrings, inner thighs & quads; plantar fasciitis & heel pain; chest & shoulder pain rehabilitation; arthritis & osteoporosis; improving overall flexibility.